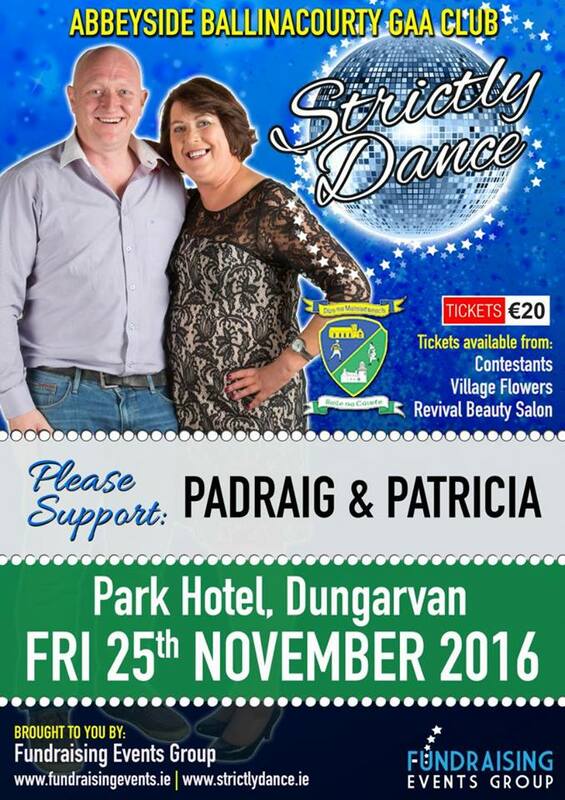 Thanks to each and everyone for making Friday night's 'Strictly Come Dancing' such a huge success. 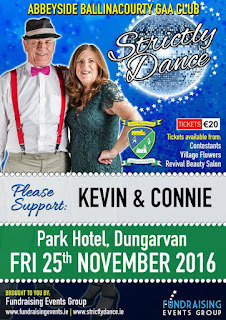 From the sponsors to the patrons, the organising committee to the dancers, this must go down as one of the most entertaining social nights in the history of our club. 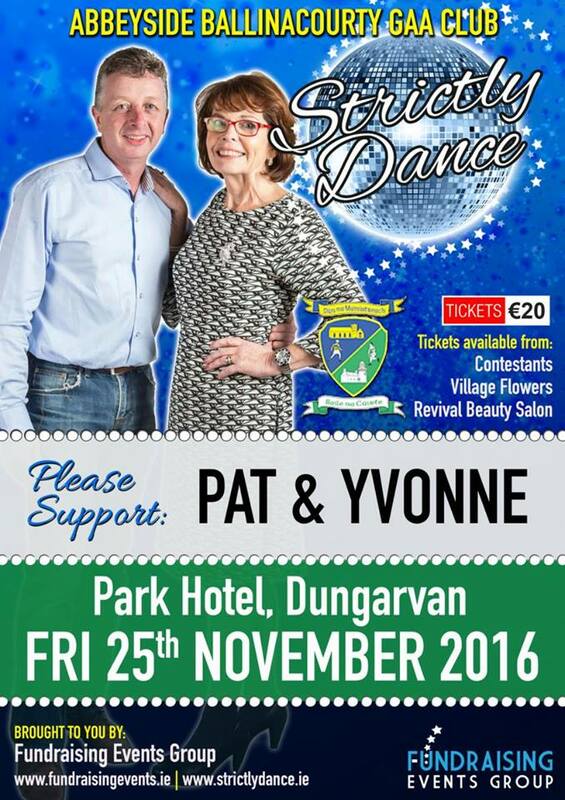 Well done to Pat Keane and Yvonne Sheehan on being crowned champions and to all the other couples for taking part. Our ever popular Jack the Joker fundraiser continues this Sunday night in Crotty’s Bar where the jackpot is €3,600 as on Sunday night Alan Tobin was drawn out of the drum and chose card number 30 which wasn’t the Joker but he did win €50. 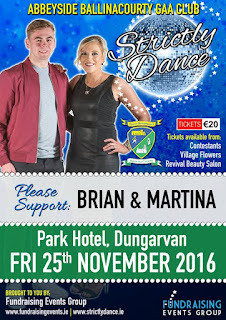 The Morning Club and Theresa McGovern won €25 each. 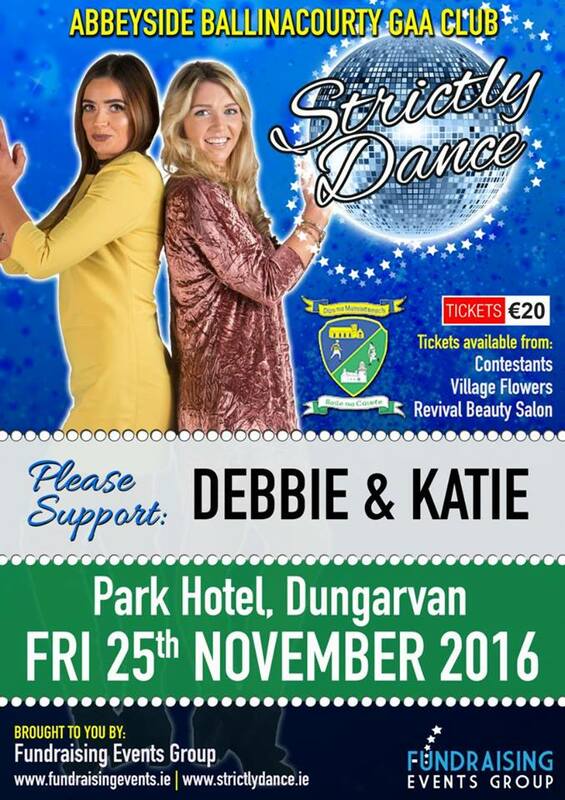 As well as our group of ticket sellers tickets can be purchased from Convenience Store Ballinroad, Village Flowers, Spar, Mousies Takeaway, Minnies Bar, Abbeyside Post Office and Crottys Corner Bar. On behalf of all in the club we would like to congratulate Lismore on their fantastic victory in the Munster Club Intermediate Hurling Final on Saturday last. 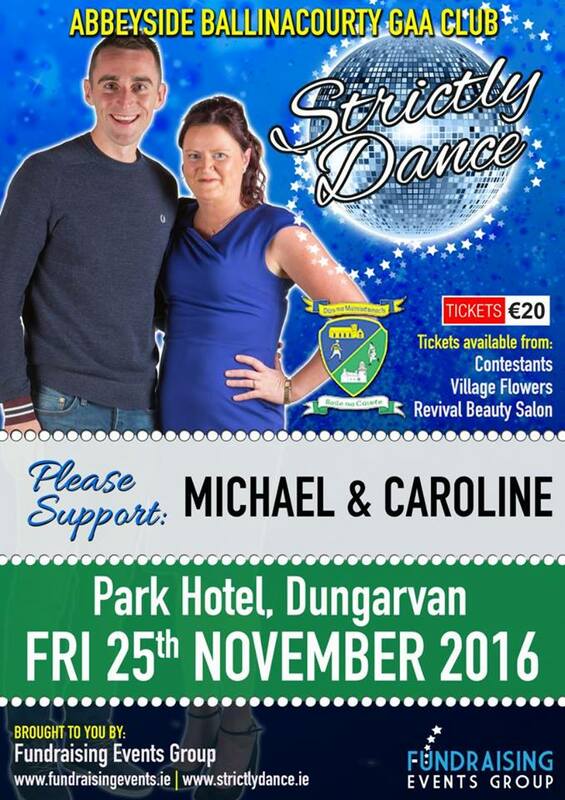 We would also like to wish The Nire the best of luck with their Munster Senior Football Final this Sunday in Mallow. 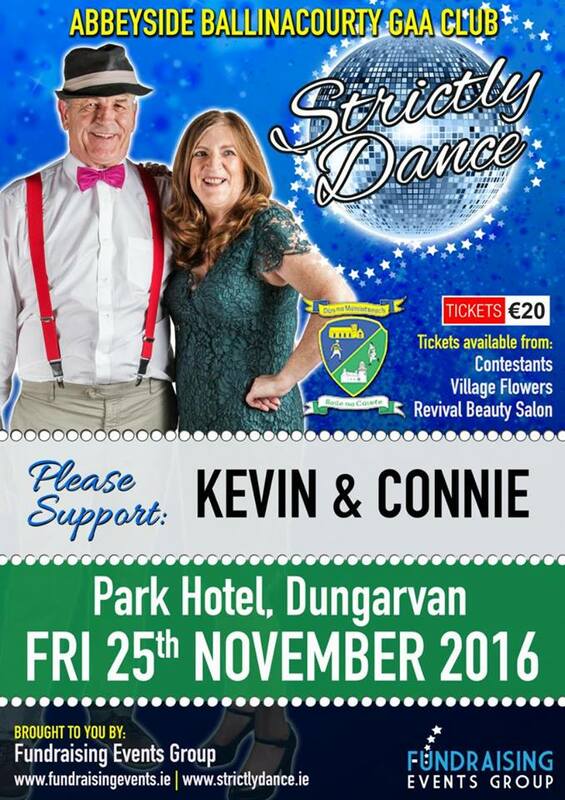 The countdown has begun for what promises to be a great nights entertainment and fun in The Park Hotel, on Friday November 25th as we stage our first Strictly Dance Fundraiser. Our dancers have commenced their training and are currently learning the group dance. 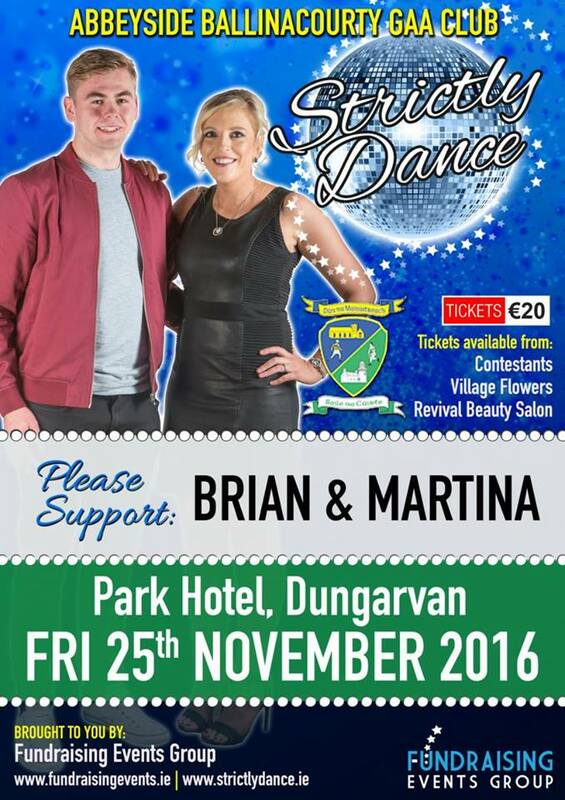 Tickets for the event are priced at €20 & are available from all thedancers as well as Revival Beauty, Main Street, Dungarvan & Village Flowers, Sexton Street, Abbeyside. Be sure to get yours early to avoid disappointment. 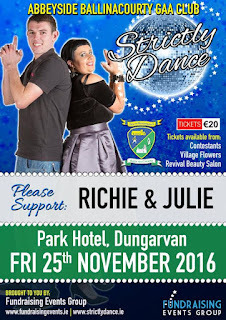 Check out the pairings on the Strictly Abbeyside/Ballinacourty GAA Facebook page for more details and information. 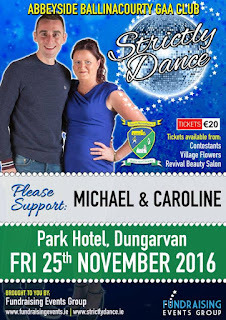 For those who are away and would like to sponsor a dancer you can do so on our go fund me page www.gofundme.com/2xqf4v8 or search the page on gofundme.com: Strictly Dance Abbeyside/Ballinacourty GAA. 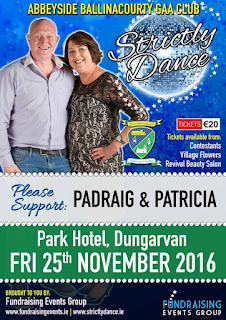 Just comment on the name of your chosen dancers when sponsoring. This Saturday afternoon we take on Comeragh Gaels in the Western Semi Final at 2:30pm in Fraher Field. 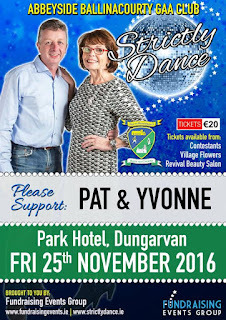 This week our club bingo session moves to The Park Hotel for what promises to be a great afternoon where there will be €3000 in prizemoney. 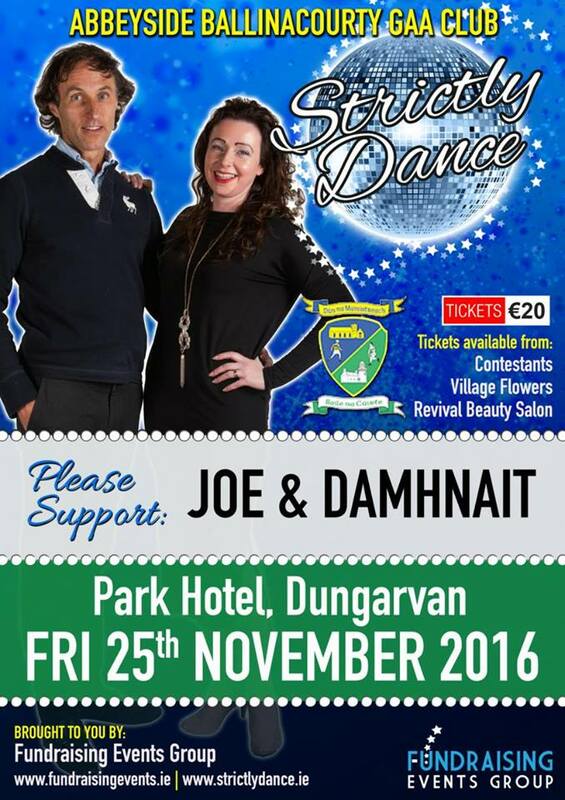 Any person who is interested in managing our Adult teams in 2017 is asked to submit their name to Jonathan O’Donovan by December 8th at 8pm. For 2017 the Club Committee have decided that both of our senior teams will be managed by the same person so those submitting their names must be willing to take on the responsibility of managing both teams. This practice is also to be implemented with our Junior / Intermediate and Under 21 teams where the management teams must take the teams in both codes. Our ever popular Jack the Joker fundraiser continues this Sunday night in Crotty’s Bar where the jackpot is €3,400 as on Sunday night Fergal Fraher was drawn out of the drum and chose card number 10 which wasn’t the Joker but he did win €50. 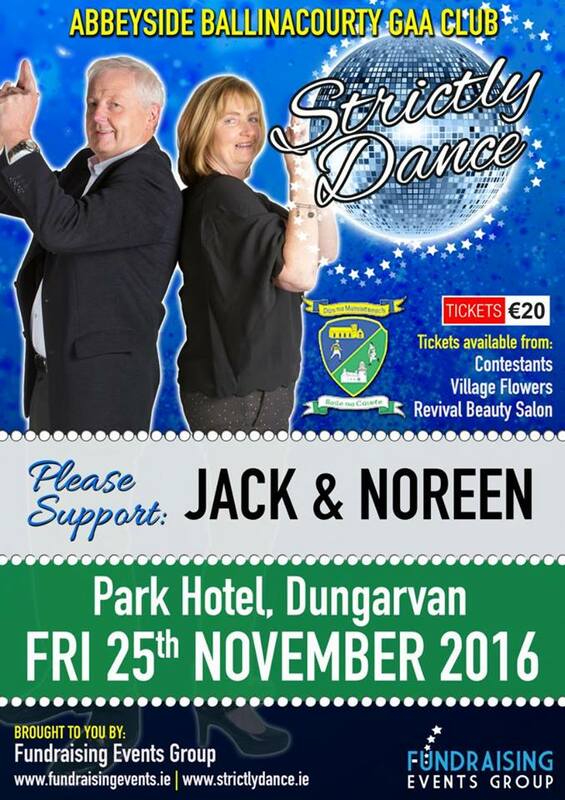 Jonathan O’Donovan and Lar Power won €25 each. 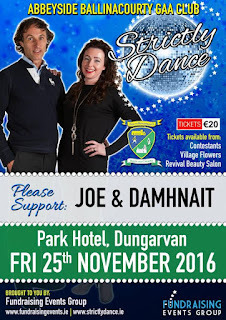 As well as our group of ticket sellers tickets can be purchased from Convenience Store Ballinroad, Village Flowers, Spar, Mousies Takeaway, Minnies Bar, Abbeyside Post Office and Crotty’s Corner Bar. 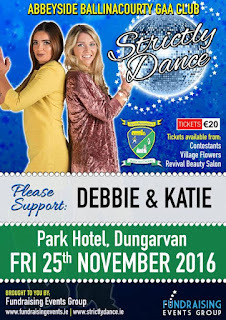 This Sunday Fraher Field will host the All Ireland Ladies Football Club Semi Final between Abbeyside and Annaghdown of Galway. We would all like to wish the Abbeyside women the very best of luck with the game and urge as many supporters as possible to get over to Fraher Field and cheer on the team. On behalf of all in the club we would like to congratulate The Nire on their fantastic victory over Carberry Rangers in the Munster Club Championship on Sunday last and wish them the very best of luck ahead of next week’s Munster Final. We would also like to wish Lismore the best of luck with their Munster Intermediate Hurling Final this Saturday in Mallow. 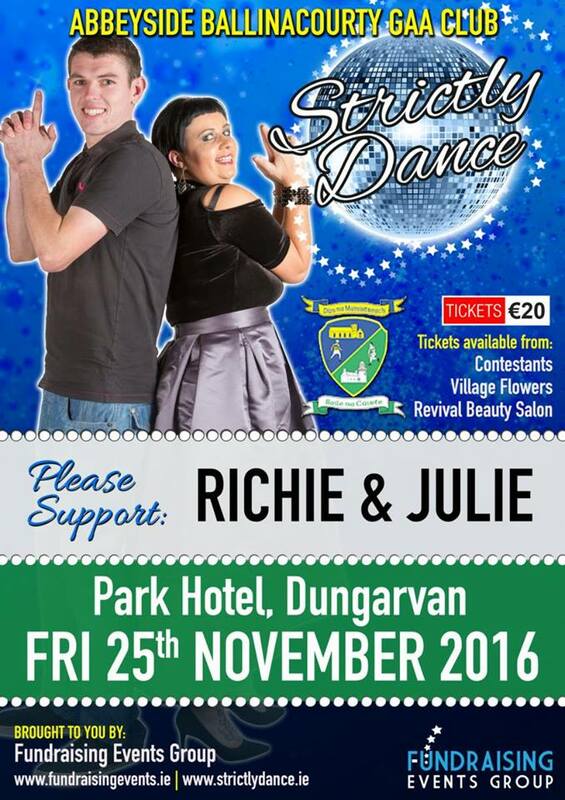 The countdown has begun for what promises to be a great nights entertainment and fun in The Park Hotel, on Friday November 25th as we stage our first Strictly Dance Fundraiser. Our dancers have commenced their training and are currently learning the group dance. 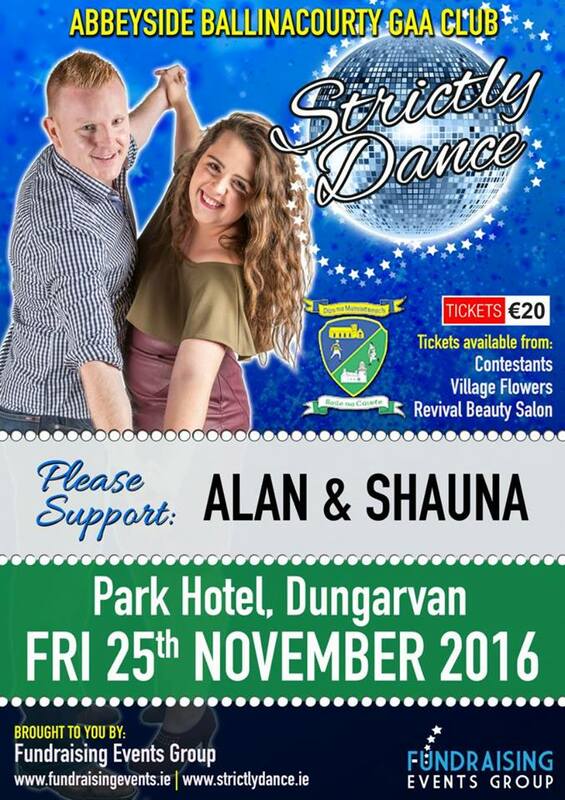 Tickets for the event are priced at €20 & are available from all the dancers as well as Revival Beauty, Main Street, Dungarvan & Village Flowers, Sexton Street, Abbeyside. Be sure to get yours early to avoid disappointment. 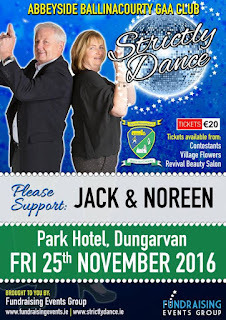 Keep an eye on the Strictly Abbeyside/Ballinacourty G.A.A. 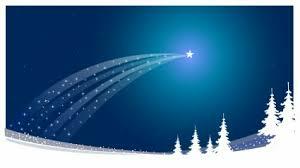 Facebook page for more details and information over the next few weeks! Our club bingo will continue this Sunday night, in the CBS Hall where the jackpot is €1000.